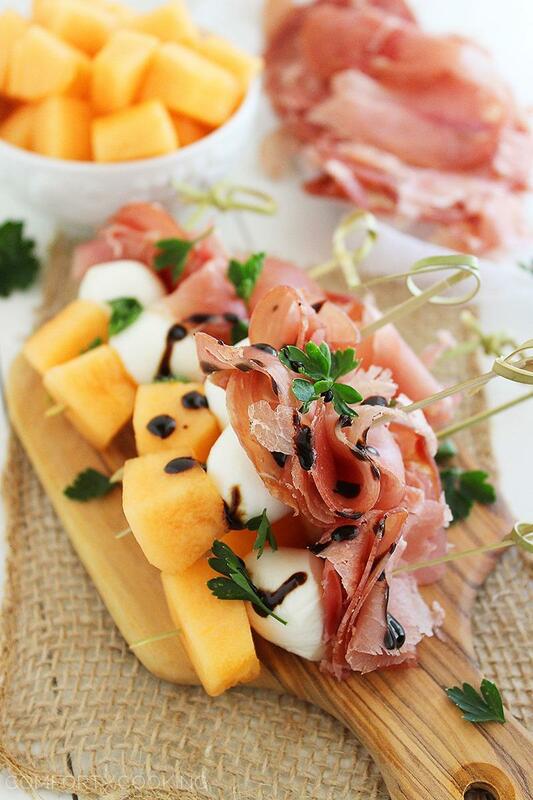 These sweet and salty skewers with prosciutto, melon and creamy mozzarella are easy bites for any spring party! Drizzle with balsamic reduction for a tasty tang. 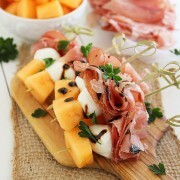 If you asked me to wrap up all my favorite flavors – sweet, salty, creamy, tangy – on a cocktail skewer, I’d pile it with fresh melon, paper-thin proscuitto and soft mozzarella! There’s just no appetizer as easy, elegant and essentially “summer” tasting as the combination of all three. With a drizzle of balsamic reduction, each bite is a little bit of bliss! I may have been a naughty preggo with the proscuitto indulgence, but hey. This baby’s gotta learn to love Italian! Capiche? Once the weather warms, the color in my kitchen is instantly amped up by a bit more green, white and red, after all! Handfuls of plump basil and juicy, garden-fresh tomatoes are always in stock. Red bell peppers and hot jalapeños hang out in a basket on my counter, inspiring me to cook something delicious and zesty! And of course, fresh mozzarella joins the mix and adds pure white creaminess to all the vibrant color. We can’t get enough of the stuff – from caprese salads to pizzas and sandwiches, it adds amazing melt-in-your-mouth richness to our savory favorites. It’s simple skewers like these that make me love mozzarella best, though… and make me want to put on a spring dinner for friends, al fresco style! 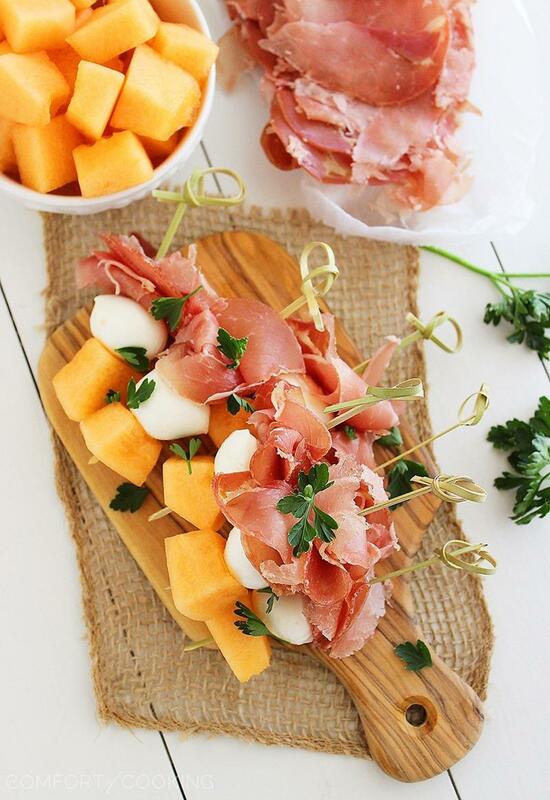 For warm weather entertaining, you’ll love these salty, creamy proscuitto bites with mozzarella and cubed cantaloupe! Feel free to substitute thinly sliced ham for the proscuitto, since the good stuff can be pricey (but worth every penny). You’ll get lots of bang for your buck out of just 1/4 pound! Not much is needed for this recipe. Enjoy your spring weekend, foodie friends. I have lots more deliciousness I can’t wait to share with you next week! Love these skewers, so perfect for entertaining! Just gorgeous! I love how fancy they are yet they’re so easy to make! what a pretty addition to a lunch buffet. Love these- so fresh and colourful! Those flavours all sound amazing! Gorgeous appetizer and perfect for spring! Such wonderful snacks for spring and so gorgeous! These are gorgeous, Georgia. So fun for spring and summer! So simple and so delicious!! It’s the simple recipes like this that are always the first to go at a party. So fresh and yummy! Simplicity at its best, Georgia! What a refreshing combination of flavors! Your not just making it tasty and beautiful, your appetizer packs some seriously balanced nutrition! Awesome! These would be perfect for summer when we have company over!! Thanks for the idea!! These make me giddy! It’s just another official sign that spring is here to stay. And they’re SO beautiful too. Can’t go wrong with these fantastic ingredients! These would be perfect appetizers for any gathering! Gah this is exactly my kind of appetizer … for a party or just sitting outside with a drink in the gorgeous weather! And I love the photos – you’re making me want to go make these right now! A party on a plate for sure! Salty, sweet, and creamy are definitely one of my favorite combinations as well! I just love the colors of this appetizer, so easy to make yet so elegant looking! These are gorgeous, what a perfect way to showcase each amazing flavour and have a perfect combo! Perfect snack for spring and then entering into SUMMER!! :) YA! Love these! Great combination. 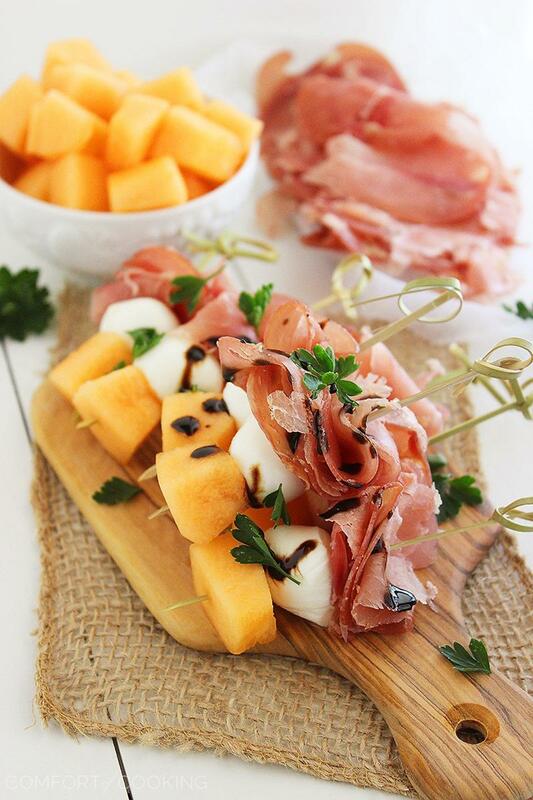 Try wrapping mozzarella and melon with prosciutto on the grill. I am currently looking for appetizers that are easy or make ahead and a bit different for my Easter family dinner. Since I am not having ham for dinner, this would be excellent. I think they look festive. Easter colors and I like the ruffled look of the prosciutto. I like combination of sweet and salty tastes. I guess that this dish will be perfect for any party. It looks very nice and appetizing so I guess that guests will really love it. 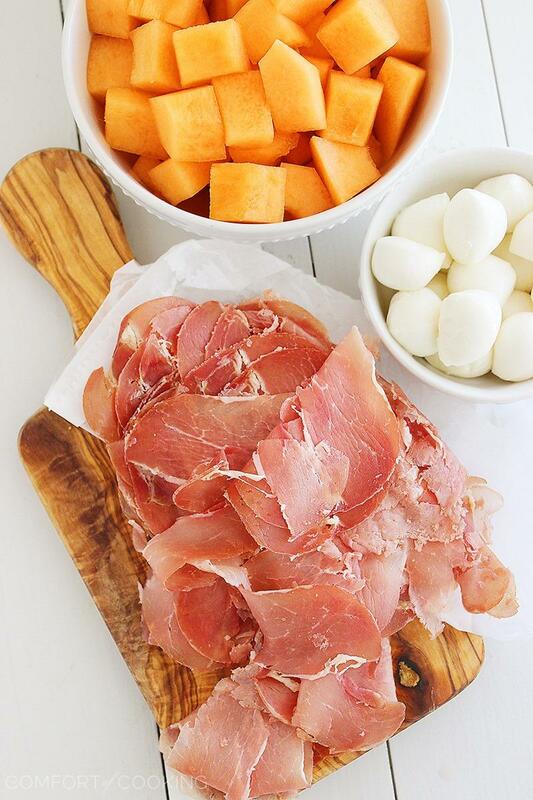 What a delicious combination.. melon and prosciutto really should taste great together. made these last night and loved them – very refreshing! I used basil, bc I think it tastes better than parsley – but they were a huge hit! thanks for the idea! I have always cherished the woods in the top of the gray thong. I’m glad to buy these boots. I no longer need to wear inappropriate shoes.